I used 4mm acrylic(perspex) for lids and they have all warped badly, probably from having the light above them or the water temperature or both. 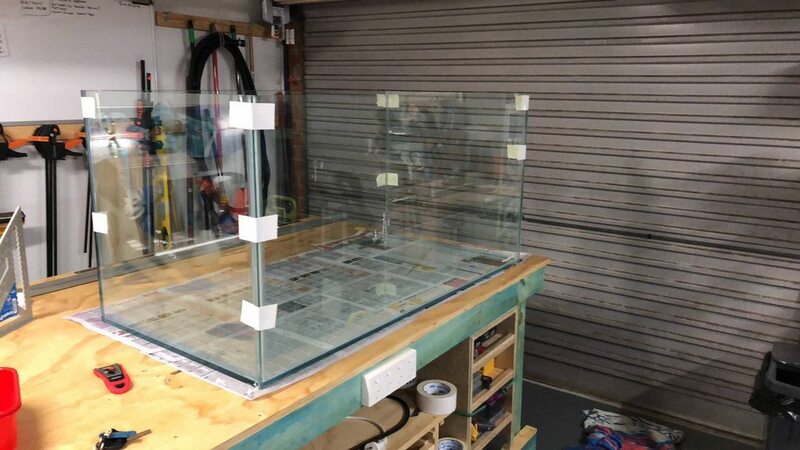 I siliconed acrylic dividers in the glass sump before I realised the silicone does not stick to acrylic! They may leak over time but the silicone on the glass will keep them in place. Mate you may want to plumb the pipes next to an edge or between two pieces of acrylic, it is awkward to remove when it comes time to clean the filter pads. One overflow should keep up with two pumps no problem. 25mm PVC will handle around 5,000 litres per hour. The one pane of glass will work but maybe experiment first to see where the top needs to be to keep your desired water level. I am guessing my pump moves around 3,000 LPH and my weir is 600mm long. I have 5mm of water spilling over it. I took heaps but not many turned out, sorry. Sold this tank and all the stuff that come with it but kept the stand and hood. Stand has been stripped back, sanded and primed read for a nice coat of black paint. The hood will remain off the tank so I haven't done anything with it just yet. 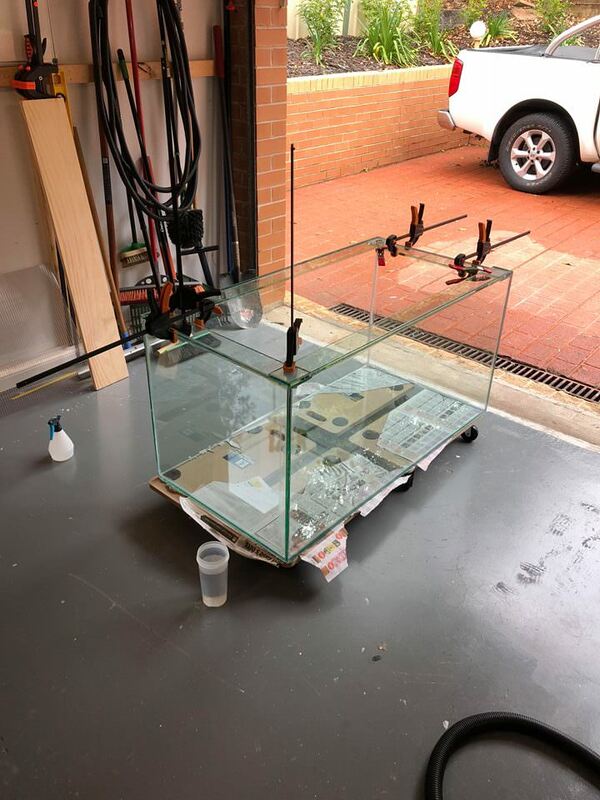 New tank will be a 4x2x2 with Euro Bracing which I almost doubled cost to get a 4x2x2 rimless but it was 19mm glass and honestly, I never want to have to move a tank that heavy. I'm moving house soon to a 4th story apartment with no elevator so moving is going to be fun! Once I have the tank though, the next challenge will be shutting down the current 4ft and setting up the new one, which i want to do a totally new scape on but also want to take some time to get it done right. Get the tank running with plants etc and then eventually move the fish over last. Not exactly sure how its all going to play out, but I definitely want to make sure I have the new scape perfect before I move fish over. Oh man, that's alot of stairs to navigate! hahaha I wish. $900 for rimless, $540 for Euro brace... lol. Well, the new 4x2x2 is being built. 80mm euro brace whole way round. cannot wait to get this tank into my new unit and set up. I have two new boxes of Seiryu Stone and have it planned to pick up another 8kg off of DDM in the following week. Next steps are to find driftwood to suite my desire or to go buy some. Congrats man. Any idea about what you want with the new scape? Maybe do some mockups in a Scapefu-Do-Jo? Ill bring extra $$$ and have a look! Just got an update! tank is looking so good! Did you go for low iron glass front? You are right, most fish seem to jump from the corners so this will pretty much put a stop to it! Last edited by Rebel; 07-10-18 at 05:53 PM. Im just so bloody keen to scape it lol. - DRIFTWOOD... still dont know what I can collect myself as I dont know what im doing. found some super nice stuff in north east sydney but hell of a drive and $120 per piece... not keen. Parents are feeding fish for now until i can get the tanks over to new place.